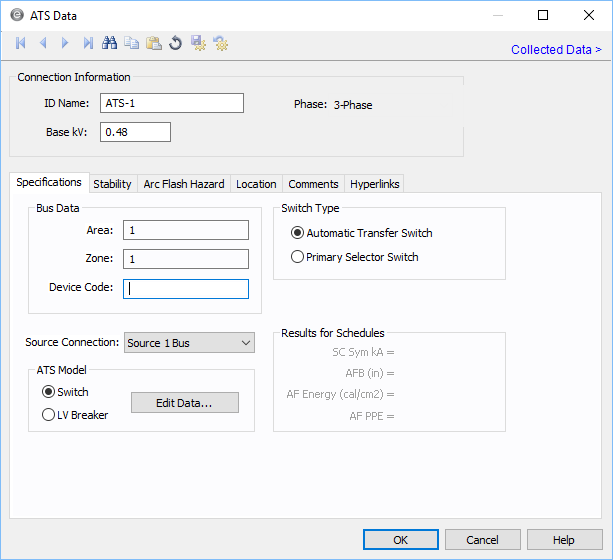 For automatic transfer switches, the program automatically assigns the names ATS-1,ATS-2, ATS-3, and so on. Base kV Base kV for the ATS. An ATS has three buses as shown by the nodes in the symbol. Note that the bus must have a kV entered before equipment can be connected to the bus. Anything less than 1kV is considered low voltage, anything 1kV or more is high voltage. Area Area numbers are used to uniquely define different areas of the electrical system. These areas can then be used for creating specific text reports from analysis operations that represent subsets of the system. For example, typical paper plant areas may be the power house (Area 1), caustic plant (Area 2), pulp mill (Area 3), and paper machine (Area 4). Area numbers are positive integers between 1 and 999. Zone A zone number is simply a sub-area. This enables even more specific reporting. You may want to define the pulp mill as Area 3 and the digester electrical equipment as Zone 2. Specific reports can then be generated for this combination without including the entire pulp mill or the other digesters. Switch Type Select between automatic transfer switch or primary selector switch. This changes the symbol used on the one-line. Source Connection Normal connection of the switch. Source 1 Bus corresponds to the bus on the left. To have the switch normally connect to the right side bus, select Source 2 Bus in the box. ATS Model You can specify the short circuit ratings of the ATS as switch or LV circuit breakers, depending upon their construction. Selecting Edit Data opens the dialog boxes for Switch Data or LV Breaker Data. 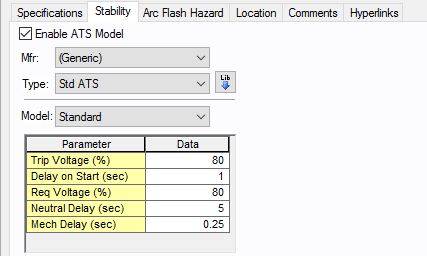 Enable ATS Model Select the check box to enter stability information. Manufacturer (Mfr) Provides a list of manufacturers available in the device library. If the desired manufacturer is not listed in the device library, you can add it to the library. See EasyPower Device Library for more information.